WAVE RUNNER 50 BRUCE ROBERTS This yacht sets the standards for elegance & ultimate comfort in a solid (steel) and stunning vessel. This is one of the very few motor yachts with a license to cruise with as many as 23 passengers available for daily/evening cruises or 8 people for a multi days cruise. The concept of intelligent use of space which defines the design of the Blue Diamond carries through to the entire layout of the boat, offering spacious interiors and careful attention to every detail. 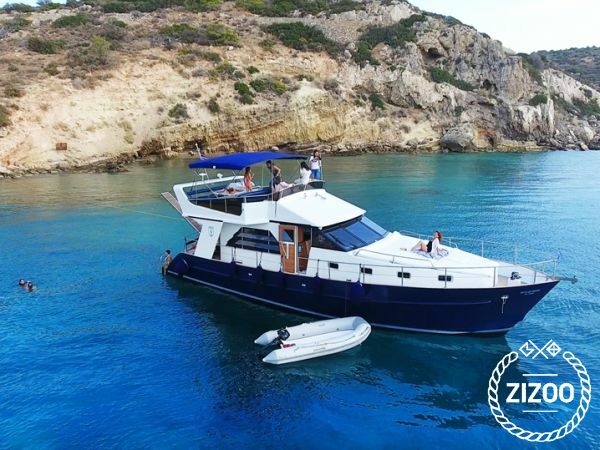 It is also among the most economic yachts to rent in Athens, ideal for large groups wishing an unforgettable low budget cruises, without compromising in comfort, facilities or services. Discover the Greek islands and the beautiful coast line, explore remote hidden beaches, or experience the energy of the island night life. Whether you want a one-day trip, overnight getaways or longer cruises, our expert captain will plan a trip to suit your needs. Bring your family and friends or plan your romantic getaway. Relax, indulge and enjoy the best of boating life. Ways to enjoy our boat: The “Must See” perspective of the Athens coastline Visits on secluded bays with crystal blue waters approachable only by boat Wonderful sunset of the Saronic Gulf Historical narration across the Athens coastline Swimming, Snorkeling, Paddle board Swimming at fantastic hidden beaches in nearby islands The relaxing joy of yachting The adventure of diving to explore shipwrecks and reefs (certified divers).The skipper is also PADI diving instructor. HALF DAY Max. 23 Passengers Duration 6h Price Includes: fuel, VAΤ, crew of two persons, clean towels, wine or beer, soft drink or juice, salomon or turkey sandwich EXTRA : 1. SEAFOOD ΒΒQ ON BOARD : shrimps, squids, octopus, traditional Greek salad, wine, beer, soft drink and fruits 50€ / person. 2. ΜEAT BBQ ON BOARD : Pork - chicken skewer (souvlaki), traditional Greek salad, baked pies, wine, beer, soft drink and fruits 30€/ person. DAILY CRUISE Max. 23 Passengers Duration 10h Price Includes: fuel, VAΤ, crew of two persons, clean towels, wine or beer, soft drink or juice , salomon or turkey sandwich EXTRA : 1. SEAFOOD ΒΒQ ON BOARD : shrimps, squids, octopus, traditional Greek salad, wine, beer, soft drink and fruits 50€ / person. 2. ΜEAT BBQ ON BOARD : Pork - chicken skewer (souvlaki), traditional Greek salad, baked pies, wine, beer, soft drink and fruits 30€/ person. 3. Possibility to dive for certified divers (on demand). MULTI DAYS CRUISES (2-7 DAYS) Max. 23 passengers during the day*,8 people can be accommodated on the boat for overnight stays in 3 cabins. Price Includes: VAΤ, crew of two persons, clean towels. Extra: Fuel * Οver 8 people can stay in accommodation on the land next to the boat.